The massive sculpture was carved in Union Square overnight. This weekend, something stood out amidst the Union Square Greenmarket and the colorful performers poised on the steps leading into the park—and it wasn't a deep discount on heirloom tomatoes. Rather, a giant elephant ice sculpture melted in Saturday's 79-degree heat—a visual representation of Africa's disappearing elephants, sponsored by South African cream liqueur company Amarula and WildlifeDIRECT. 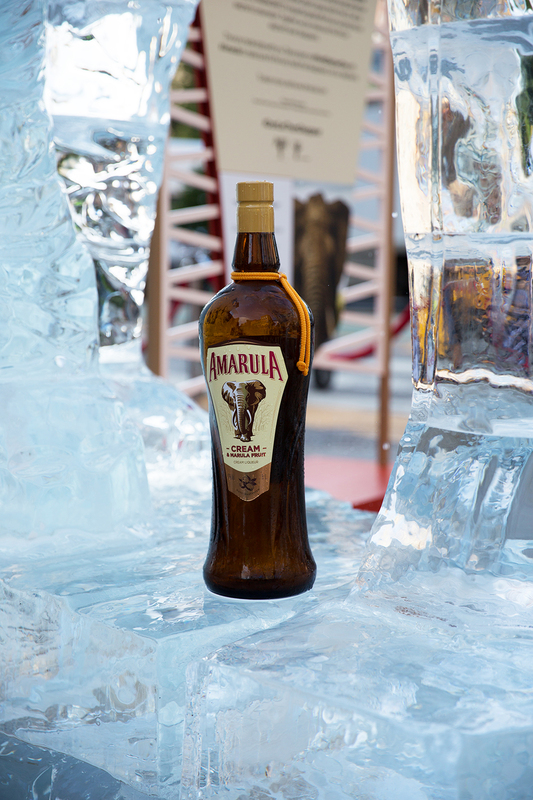 The display was part of a fundraising campaign dubbed "Don't Let Them Disappear," in which—beginning Sept. 1—Amarula will donate $1 of every bottle sold to efforts made by WildlifeDIRECT to save Africa's elephants. The campaign will continue until Dec. 31 of this year. The ice elephant (which weighed more than four tons) was sculpted from a hunk of ice brought to the park at midnight and whittled into a replica of an African elephant by 8:15 a.m. By mid afternoon, it no longer resembled an elephant, and by 4 p.m., the elephant's remains—a body without a head, trunk, or tusks—was taken from the park. The visual was meant to show the crowds gathered at Union Square "the alarming rate in which African elephants are disappearing at the hands of poachers," a press release states. Poachers most commonly hunt elephants for their ivory tusks. In the 1980s, for example, 100,000 African elephants were killed each year, the World Wildlife Fund says. Current estimates place the elephant population about 400,000. "There are only approximately 400,000 African elephants left in the world, and one is lost every 15 minutes to poachers," said Paula Kahumbu, CEO of WildlifeDIRECT, adding that "we need help spreading the word about the plight of our elephants." Amarula says the partnership with WildlifeDIRECT was a natural one. "The African elephant plays a crucial and symbolic role in the creation and spirit of the celebrated cream liqueur," a press release states. That's because "elephants begin their journey to feast on the sun-ripened fruit of the Marula trees, which grow wild ... across the subequatorial plains of Africa. This signifies to local communities the fruit is ready to be hand-harvested and ultimately turned into Amarula," according to the release. A bottle of Amarula retails for $23.99, and $1 of every sale throughout the rest of the year will go to WildlifeDIRECT's conservation efforts, which you can read about in detail here.